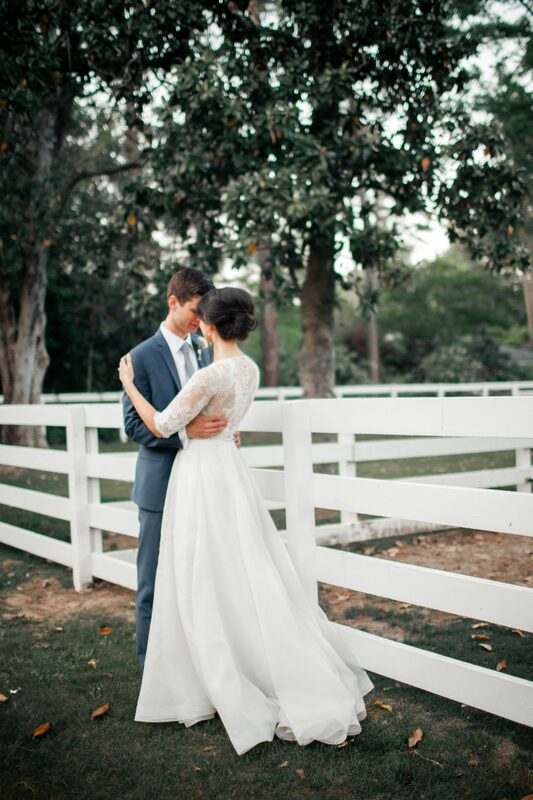 Intimate and beautiful, Liz and Jordan’s wedding day took place in Liz’s parents’ backyard! These two placed a premium on keeping things intimate, starting with their ceremonies. The first was held at Liz’s childhood church. Explained our sweet bride, “Jordan and I were both intimidated by a large wedding and saying our vows in front of a big crowd, so when we got married on April 28, 2018, we first were married in a small Catholic mass in the church I grew up in as a little girl.” The decision turned out to be an amazing one, since they were then able to relax and enjoy exchanging vows before more loved ones outdoors at Liz’s parents’ later in the day. When searching for her wedding dress, Liz knew she wanted a gown like her grandmother’s and mother’s, with long lace sleeves and a swishy A-line skirt. She found it at the Bridal Boutique of Lewisville in her customized Magnolia gown! “My parents have a beautiful home with a garden in the backyard that leads to an old grotto. Our home in Aiken, SC is located on dirt roads in the historic horse district in Aiken—so the scenery is pretty beautiful on its own. I wanted the wedding to feel elegant but not overdone. When I spoke with our florist and wedding designer/planner, Karin Jeffcoat, she described the theme back to me as “a Tuscany garden wedding” and I think she made it feel just like that. We used only white flowers and lots of natural greenery. The tables were simple with grey table cloths and lots of gold—silverware, plates, and candlesticks. There were gorgeous antique chandeliers hanging from the white tent located just a few feet away from the ceremony. Maybe I should back up a little — we were actually married twice! Jordan and I were both intimidated by a large wedding and saying our vows in front of a big crowd, so when we got married on April 28, 2018, we first were married in a small Catholic mass in the church I grew up in as a little girl. Since Jordan and I are both Catholic, it was a truly special and sacred ceremony with only our immediate family present (about 20 people). After we were married, we were able to sneak away for lots of pictures in our favorite places in Aiken and at my house. I was able to rejoin my sisters and mom to get ready for the bigger wedding in the evening back at my house on my parents’ back porch overlooking all the preparation and Jordan joined his groomsmen and ushers at an amazing hotel in downtown Aiken, The Willcox Inn.